Like many animals, cats love their food. Some cats are particular and picky about the kinds of food they enjoy and will turn their noses up at anything that doesn't meet their standards. Many felines prefer dry food to wet or vice versa, while others enjoy a combination. There are even some cats who are fond of human food. One of my cats, for example, loves crackers. The cats in these videos love to eat, and they show their passion for food in a variety of cute ways. Grab a snack and watch the fun in the following clips. 1. The answer to the question is "Yes." In this video, every time the cat's owner asks if she is hungry, the cat responds with a definitive meow for "yes." No matter when and where the question is asked, this cat is ready for a meal. Check out her cute responses in the clip below. 2. "Please, sir, can I have some more?" Omar, a large ginger cat, has a sweet way of letting his owner know that it's time for food. He gently paws his owner's arm to make his wishes known, and it's totally adorable. Watch how Omar gets his way in this video. 3. Here's some corn on the cob for two. 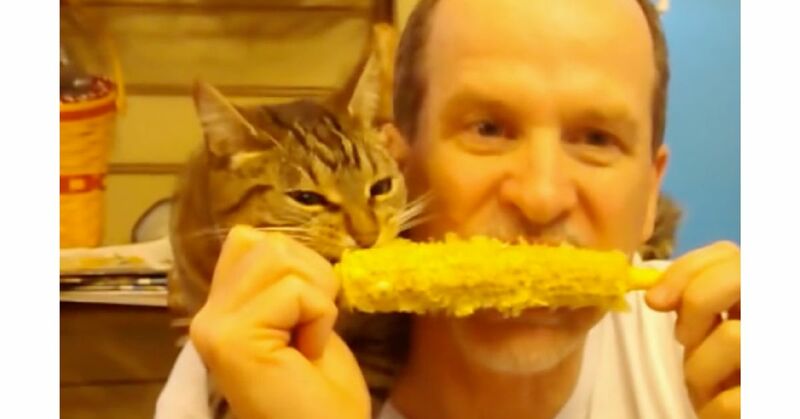 Babycat is a beloved, spoiled feline who likes nothing better than to sit on her owner's shoulder and help him eat his corn on the cob for dinner. Who can blame her? Hot, buttered corn on the cob sounds good to us. Check out this cute video below. 4. Get out of the way. This cat wants her asparagus. This beautiful brown tabby cat has a favorite vegetable: asparagus. She will do anything for a piece, including lovingly rubbing up against her owner and even reaching out to tack the food off the owner's fork. Do not get between this cat and asparagus. Watch the cat's antics in the following video. 5. Pavlov's cats wear watermelon hats, and it's too cute for words. These two cute cats know that ringing the bell means treats are on the way. How can this scene possibly be cuter? Add some watermelon hats, of course. Check out these adorable cats in hats getting their treats in this clip. 6. A stray cat receives some kindness from a meat grocer. In this clip, a stray cat enters a meat shop and begins meowing to the shopkeeper. The man correctly interprets that the cat is hungry, and starts a conversation with the feline. Within a few moments, he gives the hungry cat some scraps of meat. Check out the touching scene in this video.